Thirty years later, Mission of Burma still sounds like the future. 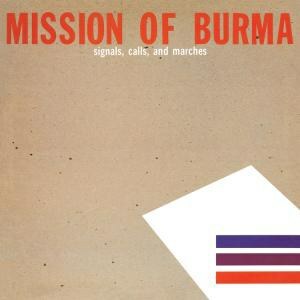 Mission of Burma is a band with a lot to offer acolytes of cool post-punk minimalism who prefer a little anthemic arena rock and musical invention with their explorations of modern sterility. The Boston trio of Roger Miller, Clint Conley, and Peter Prescott brought exuberance and lyricism to their noise rock, producing only one full-length studio album before disbanding in 1983. Producer Martin Swope added the tape effects that lend the band its dreamlike, blurred-around-the-edges sound. “Academy Fight Song” kicks off the 1981 EP Signals, Calls, and Marches. It ricochets and thrums, leaving a bittersweet impression of youthful disappointment. “Max Ernst” brings a sense of surrealism in keeping with its subject, and “Devotion” vibrates with purpose, echoing the martial theme of the album’s title. “Execution” ups the voltage before the dreamy, melodic angst of “That’s When I Reach for My Revolver.” “Outlaw” is a pure injection of funky discontent that wouldn’t feel out of place on a Gang of Four record. “Fame and Fortune” makes up for in heart what it lacks in subtlety, recalling the delightfully earnest shenanigans of Jailbreak-era Thin Lizzy. “This Is Not a Photograph” rides in on a hot coal-hopping bassline, and “Red” is a jaunty, almost poppy depiction of mental instability. “All World Cowboy Romance” closes this thrilling debut with the echoing guitars, musical dynamism, and mounting intensity that would come to define noise rock for decades to come. Vs. (1982) kicks off with the jangly, driving energy of “Secrets.” Combining primal howls and haunting lyrics, the track examines themes of disillusionment with typically image-conscious post-punk style. “Train” slows things down while adding bite and snarl to the sentiment that “nothing seems to matter at all.” Cymbals crash and overlapping voices incite a frantic dance. “Trem Two” echoes and ripples, its cathedrals of sound riddled with machine-like drums to create a soundscape reminiscent of Joy Division. The cavernous, reverberating sound evokes, as the lyrics say, a place “where thoughts are reborn.” “New Nails,” an indictment of religion, is an off-kilter rocker, and Miller famously crows, “don’t make an idol of me.” “Dead Pool” layers lyrical guitars, and “Learn How” channels the speed and muscular playing of 1970s punk. “Mica” combines oddball lyrics and powerful, syncopated drumming to showcase Mission of Burma’s irreverence and inventiveness. “Weatherbox” piles on the deliciously crunchy bass, and “The Ballad of Johnny Burma” is just as rollicking and vaguely nauseating as you’d hope. “Einstein’s Day” offers breathing room, a reverberating glade from which to observe the album’s rich shadowplay. Smash cut to “Fun World,” the perfect track to score a car chase in your standard 80’s Road Warrior dystopia. “That’s How I Escaped My Certain Fate” bounces off the walls, and its gonzo optimism is infectious. Cue the irresistible, menacing crawl of “Laugh the World Away". “Forget” thumps and sprawls, and the anthemic “Progress” is a melancholy ode to doubt. “OK/No Way” ends the album on a soaring note of anarchy. These songs are musically and lyrically complex, favoring baroque embellishment over sandblasted simplicity. Mission of Burma would go on to influence a number of seminal 1990s quiet-loud acts from Fugazi to the Pixies, but, as this reissue proves, they are much more than the sum of their imitators. 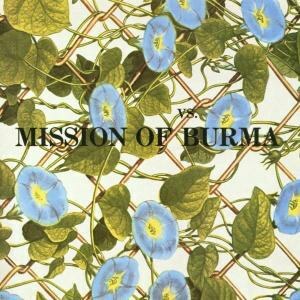 It’s easy to trace the band’s influences and hear its echoes in other noise-driven groups (Sonic Youth, for example), but even after 30 years, Mission of Burma sounds like the future.